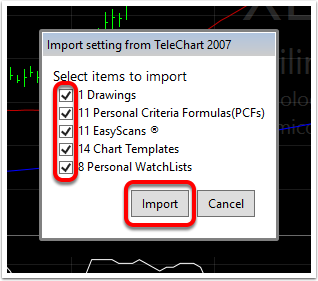 If you have our Legacy Program TC2000 v7 installed on the same computer as version 17+ you can import your personal Watchlists, EasyScans, PCF's, Chart Templates, Drawings, and Notes into TC2000 v17. 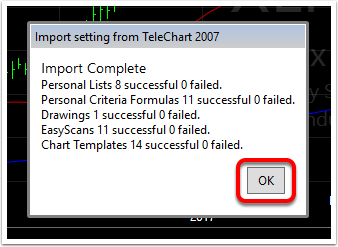 It may take several moments while the program finds, connects, and imports items. 3. 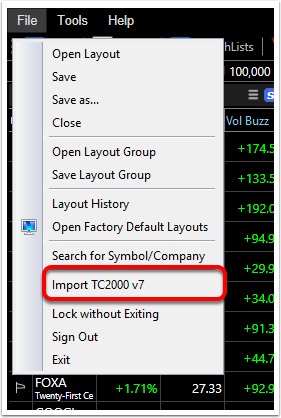 "Import setting from TC2000 v7" dialogue box will appear in the center of your screen. 4. Your settings have now been imported. 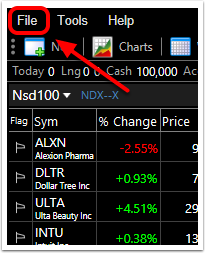 Click OK.
To access your newly imported settings, you'll need to find and open under the Personal tabs in the respecitve libraryies of the newer version.